They're cute, funny and always unique. They can be made by both adults and children, as long as an adult is available to help with the hot glue gun. They were a lot of fun and a huge hit! 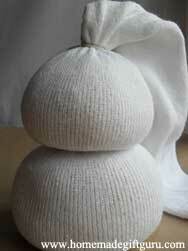 I wonder if anyone knew how easy they are to make? 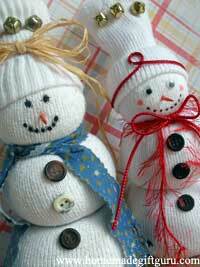 To help you get started making your very own sock snowmen, I've included the following step-by-step instructions... be sure to decorate as inspired and of course have a great time! 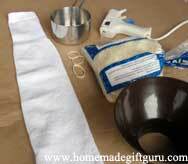 Using the canning funnel (or a sheet of paper rolled into a funnel), fill tube sock with 2 -3 cups of rice. 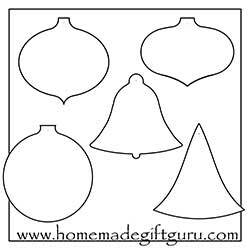 Once everything is positioned well (adults will need to do this part for children), apply hot glue in a circle between each section of the body to keep it in place. Apply a couple dots of hot glue under hat to keep it in place. Color or paint a toothpick orange for a carrot nose. Use a black marker such as a sharpie to color on black charcoal for the eyes and/or mouth. Use googly eyes for increased silliness. Cut strips for a scarf out of flannel (a shirt doomed for the thrift store works just fine) or any appropriately patterned fabric... knitters could always knit a quick little scarf. Find and use small twigs for arms. Tie a bow or glue some yarn to the hat... get creative! Make something else with tube socks... for example, making sock snowmen inspired me to something a little different, Creepy Crawly No-Sew Halloween sock spiders (and then later, sock bunnies!). 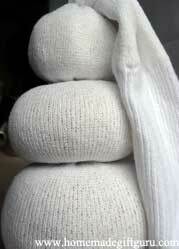 I think you could also make sock caterpillars with green tube socks and monsters with any color tube socks. Tip: Many dollar stores sell 3 packs of black, neon green or neon pink child sized tube socks. Think of all the possibilities! 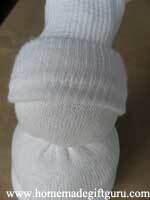 You can also make simple sock puppets... for a fun project and you can get as creative as you like. To first determine positioning for facial features, simply slip your hand inside your clean sock, using your fingers and thumb to form a talking mouth. Mark lightly with a pen the spots for eyes, nose, mouth and ears. Then glue as desired. 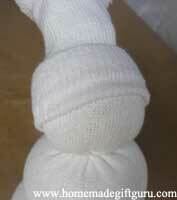 For another interesting sock puppet you can use the whole end of the sock to make one big mouth. Take two ping pong balls (or other similar white balls) and make a small black circle (like an iris) on each one. 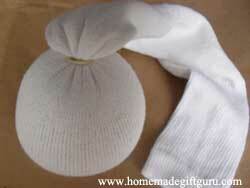 Glue them above the sock mouth and finish with yarn, lips etc. Totally goofy! Get creative and make sock girls, sock boys, sock animals... apply bows, ties, buttons, fur, patches, bells, pipe cleaners, hand stitching or whatever works! Now you can plan a puppet show using a covered table to hide behind or even better by making a card board box theater with three sides and a single window for your show. 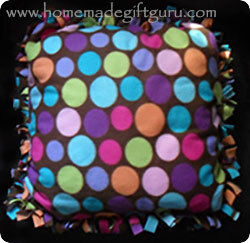 Or, if you like sewing, I recently stumbled upon Funky Sock Monkey's modern sock monkey pattern. I just love sock monkeys! 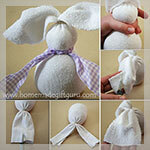 If you like making sock snowmen for Christmas, you'll LOVE making your own sock bunny for Easter! 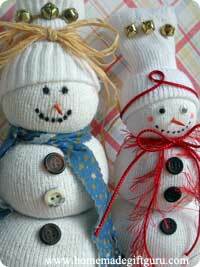 For your sock snowman... Get FREE Christmas gift tag templates here!